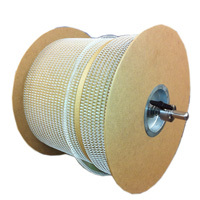 This size wire is suitable for books up to approx 190 to 220 sheets of 80gsm paper. This spool holds 4,500 loops. Spools of wire come as a continuous length that needs to be cut down to size. This is generally done on an automated machine. The double-loop wires are produced open to be inserted in pre-punched holes of the suitable dimensions. Once inserted in the proper holes they are simply crimped closed with a wire closer. 2:1 has 23 holes on an A4 sheet. Sold by the spool. Note: We can cut our Wire Spools down to custom lengths, please use the Contact Us if you require this service and we'll be happy to provide you with a custom quote.